Bugs... Why'd it have to be bugs? Makuta Bitil uses his Mask of Duplication to draw earlier versions of himself from the past, creating a fierce army of time-travelling warriors! Combined with his spikes, blades and Nynrah ghost blaster, this makes him an unstoppable foe! That just raises so many paradox issues it's insane. I mean, the obvious one is: what happens to Bitil if one of his army of past selves gets killed? Not only would it result in his present-day obliteration (making it not so much a "fierce army" as "giving the enemy dozens of chances to kill you all at once"), but it'd also result in a grandfather paradox, and if he was dead he'd never have been around to summon his past self, and as we all know, that kind of thing breaks the universe. And even if he did manage to keep all his past incarnations alive, what's to stop him in the present being continually yanked out of his timestream by his future self when he needs some extra grunts? The poor guy'd be a mess. 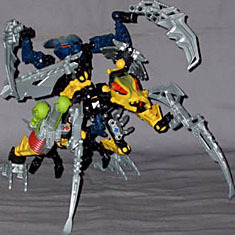 Still, no one ever accused Bionicle of making sense - just so long as they keep up the supply of cool Lego robots, who gives a toss? The Mistika Makuta (bad guys) go for a sci-fi staple in being Evil Bugs, and Bitil here is a kind of mecha humanoid pseudo-cockroach kind of thing - at least, that's my mother's best guess, and she's got a PhD in entomology so she should know. 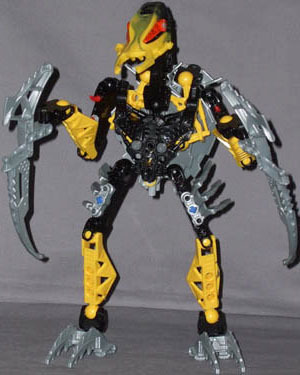 It's mainly inventive construction though - his head's the only properly "insectoid" part, the rest of him is just a matter of assembling standard Bionicle bits in an unusual way, and of course using the very insecty black and yellow colour scheme. Uniquely among the Mistika, Bitil doesn't use a multi-part torso - his body's all one piece, the high-shouldered "hunched" Matoran body, but rather than making him simple, the plain body leaves plenty of parts left over in his allocation (54 by my count) to do different things with. Rather than being mounted on a balljoint, his head is mounted on a beam with a balljoint at both ends, allowing him to do some crazy threatening hunches, or crane his neck up high. He's also got an elaborate construct on his back mounting a pair of wings, both also mounted on twin balljoint beams. For a little extra pizzazz, he's got little spikes on his biceps, instead of the usual armour plates you get there - though one slight drawback is that the lower of the two spikes on each arm is mounted in a plug which isn't especially tight, so the curved spike can rotate away from the line of the upper fixed spike. 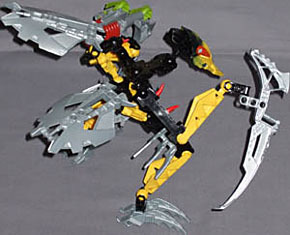 Besides the unusual neck and wing struts, Bitil's got your standard warrior Bionicle allotment of articulation: shoulders, elbows, wrists, hips, knees, ankles, balljoints all. Besides the wicked huge serrated blades he's wielding (or, in all likelihood, they are his hands), he's armed with a Nynrah launcher, the Makuta version which has green darts and a red pump, rather than the all-grey Toa version. Since the giant blades fit into the traditional "weapon" port on the hand pieces, Bitil's gun-holding hand gets a bit of rearrangement if you want him wielding the Nynrah - turn it up and sideways, and move the blade to one of the side-mounted plug port, leaving a spot for the blaster to attach next to the blade. 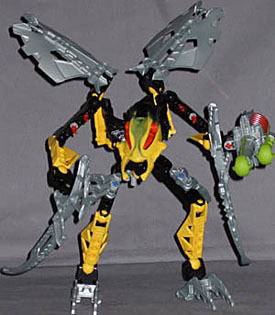 Like all the Mistika, Bitil is - theoretically - paired with a Matoran (sold separately), which gives him extra powers, or something. The Makuta have a different style of connector piece to the Toa, which puts their Matoran buddies perpendicular to their torso, rather than piggy-backing, and due to the wing assembly being in the way, Bitil's connector is pushed so far down his back that his Matoran buddy - Gavla - winds up looking more like a tail than a passenger. The illustration in the instruction booklet doesn't even bother with the connector, and just shows Gavla wedged in between Bitil's wings higher up. All in all - and taking into account that, since Gavla is styled to match his Phantoka buddy, not Bitil, they don't even look alike - best just to skip the combiner feature. He may be a reality-shattering temporal catastrophe waiting to happen, but Bitil's also a really fun monster. He looks good and creepy, he's heavily articulated for vicious-looking posing, and - kids will be kids, so it's important - he can be thrown across the room without anything breaking.